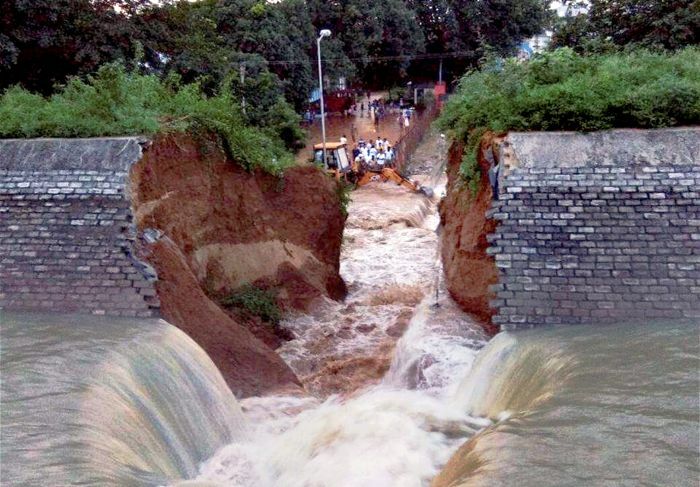 In a major embarrassment for the Bihar government, the inauguration of the Rs 389.31 crore Ganga pump canal scheme by Chief Minister Nitish Kumar on Wednesday was cancelled after a canal wall collapsed and the gushing waters inundated parts of a township. The wall broke up after being forcefully hit by the Ganga river waters when the pump was switched on for a trial run on Tuesday at Bateshwarsthan in Bhagalpur district. The CM was scheduled to inaugurate the canal scheme, which was aimed at providing irrigation facilities in the state and neighbouring Jharkhand. The water gushed into Kahalgaon and inundated areas in National Thermal Power Corporation township as well some civil areas including the residence of the Kahalgaon civil judge and the sub-judge. 'The proposed programme of the chief minister at Bhagalpur today has been cancelled due to technical reasons,' an official statement said in Patna on Tuesday. Advertisements were inserted in newspapers on Tuesday about the inauguration of the project by the CM in the presence of Water Resources and Irrigation Minister Rajiv Ranjan Singh Lallan and local Congress MLA Sadanand Singh. "A probe by Principal Secretary, Water Resources Department, has been ordered into the matter," Lallan said. On his part, Principal Secretary Arun Kumar Singh admitted of "department's fault" in not checking the canal before its inauguration. "I personally express regret on behalf of the department," he told reporters in Bhagalpur. He said stringent action would be taken against officials found guilty and the project would be inaugurated "after two months" during which the deficiencies would be addressed. Meanwhile, the minister said "it has come to light the NTPC had constructed an underpass below the canal in the past" which could have weakened the canal. "The probe would look into all the possibilities." The Principal Secretary said the department is yet to check the papers to ascertain if a no objection certificate was taken before constructing the underpass. NTPC Kahalgaon Executive Director Rakesh Samuel, who met the Principal Secretary, said the underpass was constructed long ago and he was yet to check old records. He, however, added, "The NTPC does not do any work without obtaining NoC." The minister said the canal was built during 1985-88 and the government just did the mechanical part of the project by constructing the pump station in the past one year to lift Ganga waters for irrigation purposes. "But officials should have checked the canal, too, before its scheduled inauguration," he said. The collapse invited harsh comments by opposition Rashtriya Janata Dal which said it was constructed with "poor quality" materials. "It is a glaring example of corruption under the Nitish Kumar government," RJD President Lalu Prasad alleged in Patna. 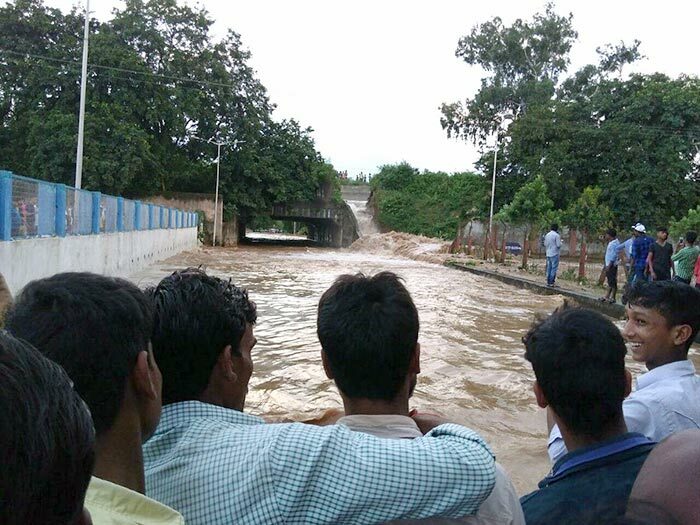 "Earlier rodents caused breach in embankments to trigger flood in Bihar. Did crocodiles break the canal wall with the help of their mouth this time in Bhagalpur?" he said taking potshots at the state government. Prasad said the Water Resources minister should quit. Lallan brushed it aside saying Prasad had no moral right to issue such "sermons". Rebel Janata Dal-United leader Sharad Yadav also attacked the government over the incident. "Did any such tragedy happen when a project worth about Rs 400-cr could not be inaugurated due to breach in the canal a day before?" he asked. The canal is a joint scheme of Bihar and Jharkhand, under which 18,620 hectares of land in Bhagalpur would get irrigation facility while 4038 hectares of areas in Godda district of Jharkhand would be irrigated, a government brochure on the project said. The Rs 389.31 crore project has a total irrigation capacity of 27,603 hectares out of which 22,816 is in Bihar and 4,887 hectares in Jharkhand. The Planning Commission had originally approved the project in 1977 at an estimated cost of Rs 13.88 crore. The first administrative approval to the project was provided in 2008 involving a cost of Rs 389.31 crore, the brochure said. Is India investing enough in infrastructure?